Here’s another historical example of close quarters. Mikkel and Hage Sinnes emigrated from Telemark, Norway, in 1849. In 1855, Mikkel constructed this building. It served as his blacksmith shop, but the couple also lived here for a year, until a home could be built. An infant was born during this time, but did not survive. 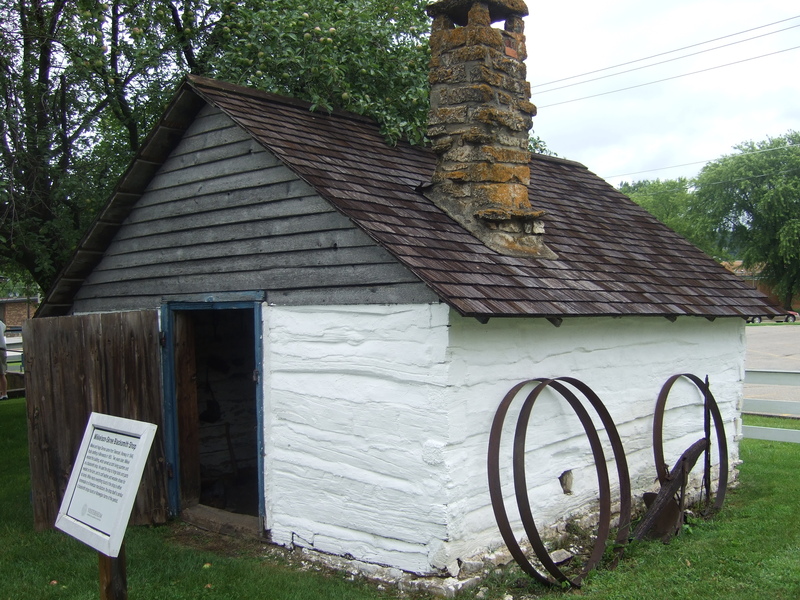 The building has been restored at Vesterheim Norwegian-American Museum in Decorah, Iowa. Imagine spending a winter in this small cabin. Or delivering a baby here. Or tending a sick infant here. The lower level held the shop; there was a small loft above. If you’ve ever visited a working blacksmith shop, you know how pervasive the soot and smoke can be. Burning coal has a distinctive and lingering odor, too. Visiting a place like this is humbling. Our ancestors experienced a lot in their efforts to build a better life. Remembering reminds me to appreciate my own warm, cozy house. This entry was posted on February 12, 2011 at 11:13 pm and is filed under INTERPRETATION, Vesterheim Norwegian-American Museum. You can follow any responses to this entry through the RSS 2.0 feed. You can leave a response, or trackback from your own site. Hardship manifests differently through history but the emotional impact has to be similar: isolation, fear, anxiety, etc. I feel for the parents who suffered the death of their child here and wonder at the soot and smoke impacting the child’s lungs. Sad.